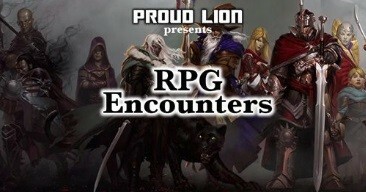 If you plan to attend Encounters, please join our Facebook group for all communication (https://www.facebook.com/groups/ProudLionRPGEncounters/). Learn to play Dungeons & Dragons 5th Edition and other RPGs with Proud Lion! RPG Encounters is a weekly event for casual players who are new to D&D and roleplaying games, or would like a refresher. RPG Encounters meets weekly at the Proud Lion Gaming Centre on a casual basis, allowing players to drop-in and drop-out as they like - there is no commitment to attend every week. Brand new players are given priority for seats, and your first week is free - after that it is £1 per week to play. For your first session, you don't need to bring anything - we'll provide everything you need to get started! After that, you'll need to bring your character sheet and a pencil each week. You may also wish to have your own set of dice and a rulebook, but this is not required. RPG Encounters runs over a six month season (March to August, and September to February). Please note RPG Encounters does not run during Race Week, between Christmas and New Year, or on the last week of the six-month season.